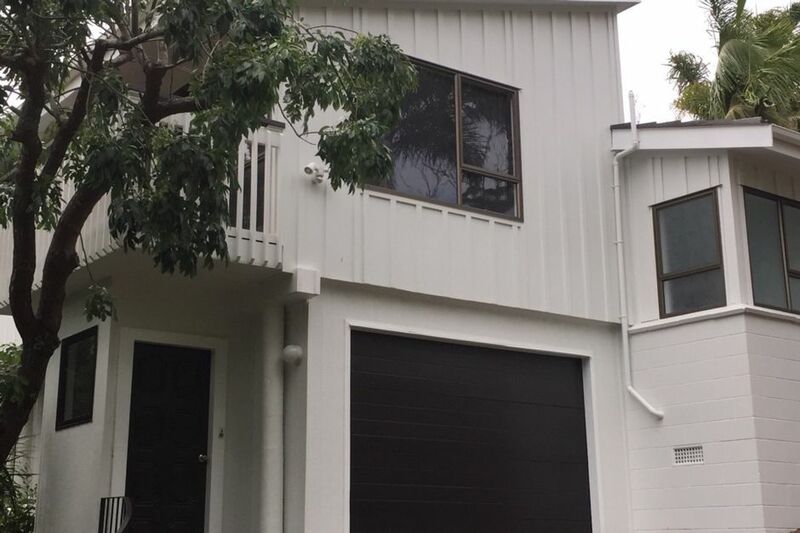 Situated amongst the trees, this luxury 2 bedroom house offers ample space for those seeking a peaceful base from which to explore the North Shore, or further afield. With the golf course, gorgeous bush walks on your doorstep, and the picturesque family friendly Campbells Bay Beach a short stroll down the hill, this is a wonderful place to stay. Enjoy a relaxing wine on the balcony with views over the treetops or meander along the stunning coastal walk that links Campbells Bay to Mairangi Bay (10 mins), to Murrays Bay (further 10 mins) and on to Rothesay Bay and beyond. Alternatively the city is a 15 minute drive (off peak) or a bus stop is located at the end of the street. For those looking for a longer stay, or relocating to New Zealand, this area offers top schools from primary to High School, as well as a wonderful Kiwi lifestyle. Large open plan Lounge, with balcony, Dining and fully fitted Kitchen with quality appliances, fridge/freezer, full oven, and hob, dishwasher, microwave. Quality linens, towels (incl beach towels), hairdryer, iron and ironing board, cleaning products. Driveway is quite steep and can be a little tricky to access garage. Hosts more than happy to help show you how to access and park. Otherwise parking available on street (quiet cul de sac). Absolutely love everything about this place - very friendly and helpful owner Fenella, convenient location, beautiful view, quiet setting, clean, stylish and well equipped rooms with latest kitchen and bathroom. Will definitely revisit! A friend and I stayed in the Campbells Bay property for a week. Right from the start Fenella's communication was fantastic. She even went to the effort of getting some groceries for our arrival! The property was clean and very well maintained. Absolutely perfect. I would highly recommend this property. Thanks Fenella and Fraser. Fantastic house in a great location. Fantastic house in a great location. Very peaceful, well appointed. Included everything you could possibly need. Beds were extremely comfortable. Only a 10 minute walk to the bus route, or a little further to a lovely beach. Very clean, excellent condition, handy location, would stay there again. A lovely property. Great value for money. A large apartment with a huge well equipped kitchen. Would recommend for anyone looking for somewhere to stay on Auckland's North Shore.